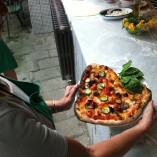 Pizza Class in Chianti | Tuscanyex | TUSCANY Experience - Excursions - Exploring - Expressions - Exclusive - Experts and so Exciting!! One day, on my way back from an amazing Chianti Classico tour, I found the happy end at a locally suggested Pizzeria. Here I met Gabriele, the Pizza maker, who baked me the most tasteful, crispy and soft Neapolitan style Pizza I ever had. My friends and I have been his fi rst students, since then I scheduled this late-morning Pizza Class exclusively at his place. The sharing experience worth the trip, particularly enjoyable with kids too, you play with healthy ingredients, consistency and timing, with your hands on the perfect dough. After some tried-and-true traditional dressings, you top a yummy Pizza with your own sweet or salty ingredients and bake it in the wood fire oven for lunch. Simply delicious!